The protest at Lear, above, is the second walkout to strike a GM Oshawa supplier. About 100 workers at the Inteva Products plant, also in Whitby, Ont., walked off the job Jan. 15. TORONTO — Production at General Motors' plant in Oshawa, Ontario, stopped at approximately 12:30 p.m. Eastern time Friday after the automaker exhausted its on-hand supply of seats from a Lear Corp. plant, where workers walked off the job. Over 200 workers at the feeder plant, which supplies seats for the cars and trucks assembled at Oshawa, did not work their day shift, but the next shift will start work at 2:30 p.m., said Local 222 President Colin James. GM has announced plans to end production at the longtime Oshawa plant, drawing protests from union and government officials across Canada, who have mounted a campaign to save the factory. It was unclear if the output of both trucks and cars was affected, what impact the stoppage had on daily production, or when production would resume, said GM Canada spokesman David Paterson. Oshawa, which runs at 30 per cent capacity, produces about 250 Cadillac XTS and Chevrolet Impalas cars daily, on a single shift. The plant also finishes assembly of outgoing models of the GMC Sierra and Chevrolet Silverado trucks, which are shipped to Oshawa from a plant in Indiana. It produced 450 of the pickups daily over two shifts. 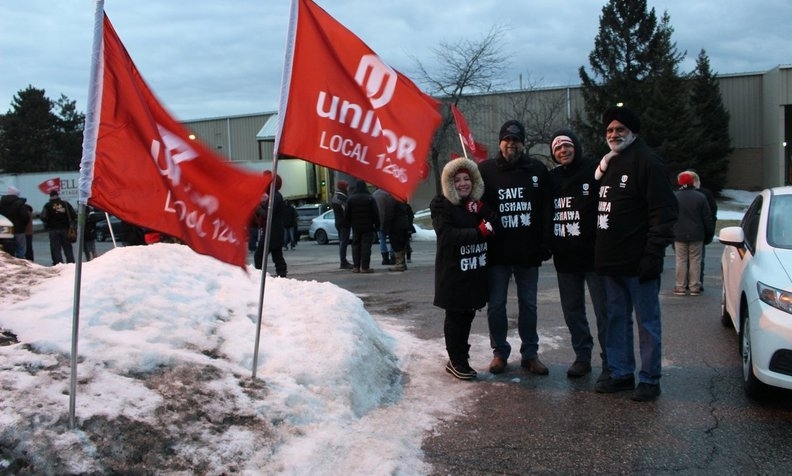 "Unifor 222 is engaged in an illegal action at a local supplier, Lear seating that supplies the Oshawa Assembly Plant," Wright said in an email. "GM Canada continues to call on Unifor to begin discussing transition and training support for Oshawa assembly workers." Paterson did not know if there would be adequate supplies for the second truck shift starting at 2:30 p.m., or whether that shift could be delayed until supplies arrived. GM Canada, in a statement emailed to Automotive News Canada, said: "Unifor 222 is engaged in an illegal action at a local supplier, Lear seating that supplies the Oshawa Assembly Plant. GM Canada continues to call on Unifor to begin discussing transition and training support for Oshawa assembly workers." Local 222 also represents about 2,600 workers at the affected GM Oshawa plant. The union also represents about 1,800 workers at plants supplying GM's Oshawa operations. The action comes just a day after Unifor President Jerry Dias met with UAW leadership in Detroit, where the two unions pledged to “work better together” in their campaigns against General Motors’ planned cuts. This is the second walkout to strike a GM Oshawa supplier. About 100 workers at the Inteva Products plant, also in Whitby, Ont., walked off the job Jan. 15. Unifor also staged a sit-down protest on the day shift at General Motors’ Oshawa, Ont., assembly plant on Jan. 8, stopping production for about 90 minutes. Members then erected a blocked at GM Canada’s headquarters in Oshawa, forcing non-unionized, white-collar employees to work from home on Jan. 23 and 24. Meanwhile, the union and Lear have had a contentious relationship of late. Lear threatened to close its Ajax, Ont., seating plant after 94 per cent union members who voted there rejected a tentative contract on May 1, 2018 and remained on strike. Two days after Lear made its intention to close the plant known, Unifor members ratified a new four-year labour contract to continue supplying Fiat Chrysler Automobiles’ assembly plant in Brampton, Ont., which builds the Chrysler 300, Dodge Challenger and Dodge Charger. With files from Greg Layson and Automotive News Canada.